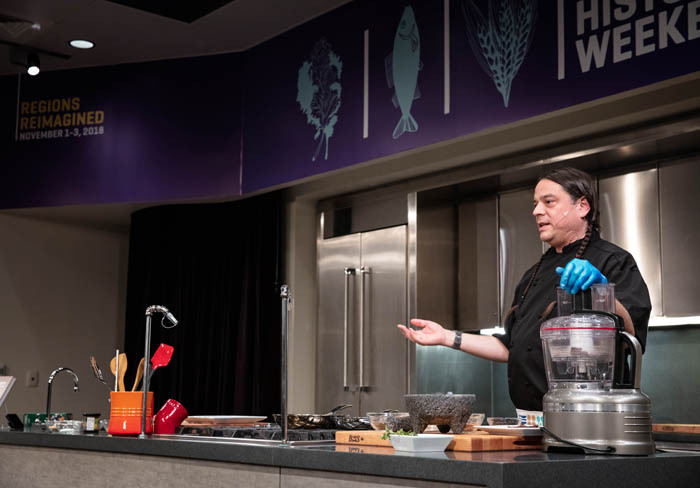 When Chef Sean Sherman began speaking about his experiences growing up on the Pine Ridge Reservation in South Dakota, he shattered all-too-common stereotypes of indigenous life in 20th-century America. He jokingly noted that some people expect to hear how he hunted buffalo with his slingshot as a kid, but that romanticized myth of American Indian foodways had nothing to do with his work of rediscovering the foods that sustained his ancestors. He shared insights with museum visitors during the “The Power of Place” roundtable discussion, part of the 2018 Food History Weekend: Regions Reimagined. Yes, Sherman and his family hunted wild game, but, for the most part, he ate differently than past generations of Lakota. Like many children growing up on reservations in the second half of the 20th century, Sherman ate non-perishable foods distributed on Indian reservations by the U.S. Department of Agriculture as part of the Food Distribution Program on Indian Reservations (FDPIR). Growing up, he noted: “Our shelves were lined with government-issued canned corn, canned carrots, canned peas, canned salmon, chipped beef, saltines, white flour, and bricks of bright orange commodity cheese.” FDPIR, which began in 1977, contributed to a dramatic shift in the eating habits of communities living on reservations—a shift away from traditional indigenous food practices. That shift contributed to the development of serious health problems and a profound sense of disassociation from Native values. Within a few generations of FDPIR’s introduction, knowledge of traditional Lakota foodways at Pine Ridge have all but been forgotten. Sherman is trying to change that. He seeks to empower indigenous communities by reviving their healthful historic foodways. In his adult life, Sherman has re-acquainted himself with foods Lakota people had eaten prior to the introduction of FDPIR. Easier said than done. As Sherman noted, he “couldn’t just go online and order The Joy of Native American Cooking,” referencing Irma Rombauer’s canonical cookbook. Instead, he interviewed his grandparents’ generation, probing their childhood memories of family meals and feasts, while also combing through archives to find descriptions of historic foods of the Lakota. After many years of research into the food cultures of the Lakota and other indigenous communities, Sherman founded The Sioux Chef in 2014—a catering and food education company in Minneapolis that seeks to revitalize and build awareness of indigenous food systems. Through the Sioux Chef business and cookbook bearing the same name, Sherman is shedding light on the diverse farming, foraging, hunting, and production practices of the Lakota and a diverse array of tribes. He is also creating a pathway through which to strengthen indigenous communities’ food sovereignty. During one of our Food History Weekend live-cooking demonstrations, Sherman shared some of those historic food practices with us by preparing duck and wild rice pemmican (Mag˘áksic˘a na Psíŋ Wasná). 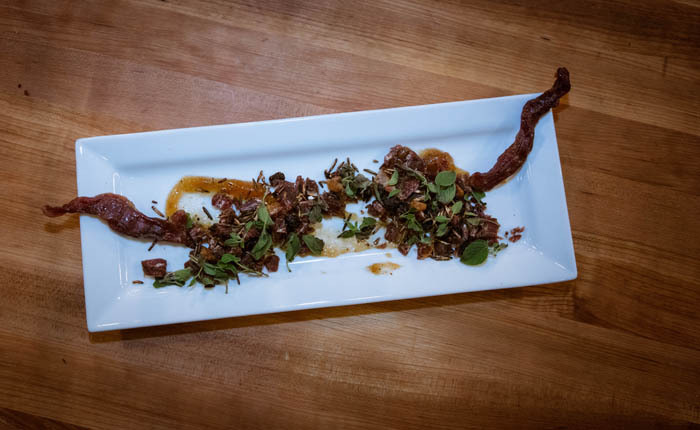 The dish features dried duck, preserved with salt and maple sugar, which could be stored for a long time and provide protein when game was less abundant. Sherman noted that like many of the dishes in his cookbook, this one does not include any ingredients brought to North America after European settlement on the continent. That means, no dairy, wheat (or gluten), beef, pork, or cane sugar, among other popular ingredients in many Americans’ diets today (and ones regularly distributed through FDPIR). Instead, the food found in Sherman’s cookbook, The Sioux Chef’s Indigenous Kitchen (2017), relies on flora and fauna indigenous to North America like sea salt, juniper, maple sugar, honey, sumac, maple vinegar, eggs, sunflower oil, wild ginger, and mushrooms. Who wants duck and wild rice pemmican, with Smith Island cake for dessert? We do!! Don’t be surprised if you start seeing more indigenous eateries, cafes, and restaurants pop up across the United States. 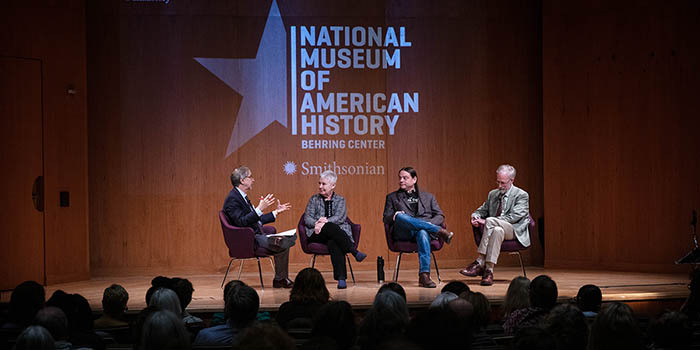 In the meantime, try out Sherman’s recipe for duck and wild rice pemmican and watch the recording of the roundtable “The Power of Place” and other conversations from the 2018 Food History Weekend by visiting our website. Dr. Ashley Rose Young is the historian of the American Food History Project at the Smithsonian’s National Museum of American History and is also the host of Cooking Up History. The live cooking demonstrations, as part of Smithsonian Food History Weekend, are generously supported by Hilton, Wegmans Food Markets, Inc., and Sur La Table. "What's on your neighbor's table..."